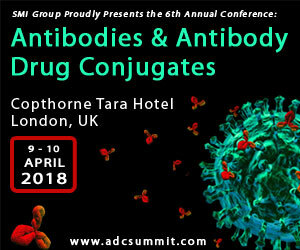 Join a huge community of ADC specialists at the Antibodies & Antibody Drug Conjugates conference this April 9th – 10th, Copthorne Tara Hotel, London. Now in its 6th year with a global presence, join a room full of scientists from Spirogen, Pfizer, Genentech, Ablynx, Seattle Genetics, Janssen, MedImmune and more! The conjugation of drug-linkers to an antibody can result in increased nonspecific uptake and catabolism in healthy tissues. This phenomenon has two potential negative consequences – unintended delivery of the drug to non-target tissues, and diminished exposure of the tumor to the ADC, however, careful design of the drug-linker can minimize this effect in preclinical models, with demonstrable decreases in drug concentrations in normal tissues paired with maximal delivery to the tumor. Toxicology and xenograft studies indicate that the optimized design both decreases off-target toxicity and improves antitumor activity, and they are currently planning to evaluate this design clinically with an anti-CD48 antibody for patients with multiple myeloma.